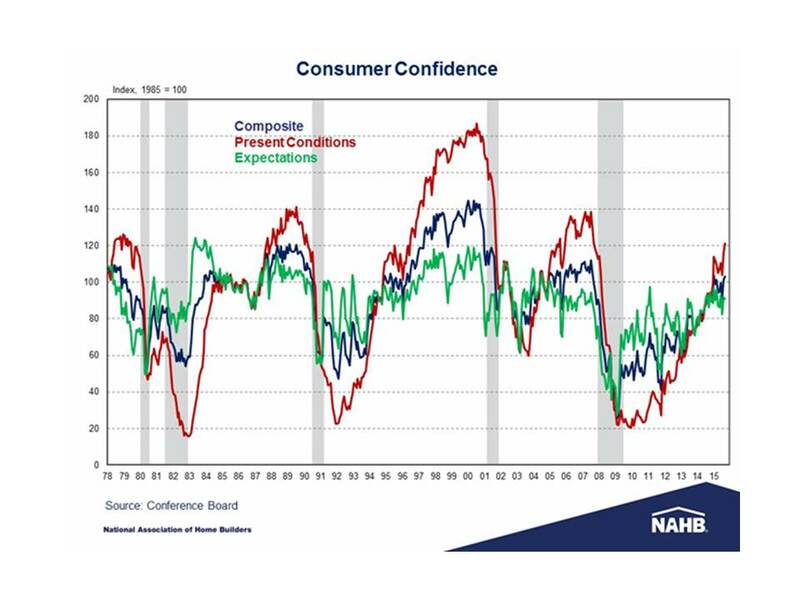 The Conference Board released its Consumer Confidence Index for September. The index is a composite of separate indexes tracking consumers’ assessments of current business, income and employment conditions, as well as their expectations for the future. The Consumer Confidence Index increased to a level of 103.0 in September from 101.3 in August. The present situation index rose to 121.1 from 115.8; the expectations index decreased to 91.0 from 91.0. The Consumer Confidence Index has rebounded to levels close to the pre-recession peak of 111.9 in July 2007. The Conference Board also reported an increase in the share of respondents planning to buy a home within six months, from 4.4% in August to 6.3% in September, confirming the August decline in home buying plans was only one dip in a volatile data series, not an early warning signal (see August blog). The Conference Board also asks respondents about their expectations regarding interest rates. In the September survey 64.4% of respondents reported they expect interest rates to be higher twelve months from now. What effect would higher interest rates have on the housing recovery? A statistical analysis of the impact of expectations of changing interest rates on plans to buy a home reveals a relatively weak relationship. 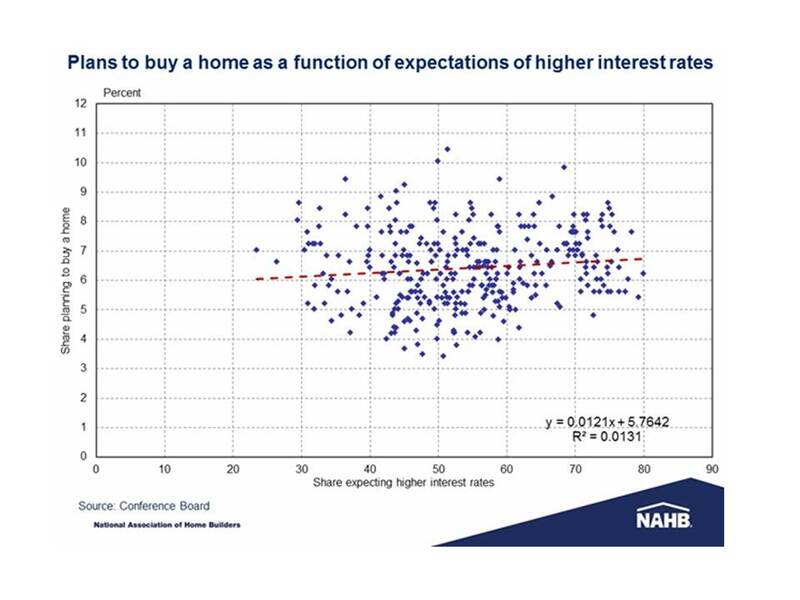 The share of respondents with expectations of higher rates has a small positive correlation with the share of respondents planning to buy a home, suggesting a small spurring effect to buy before rates increase. 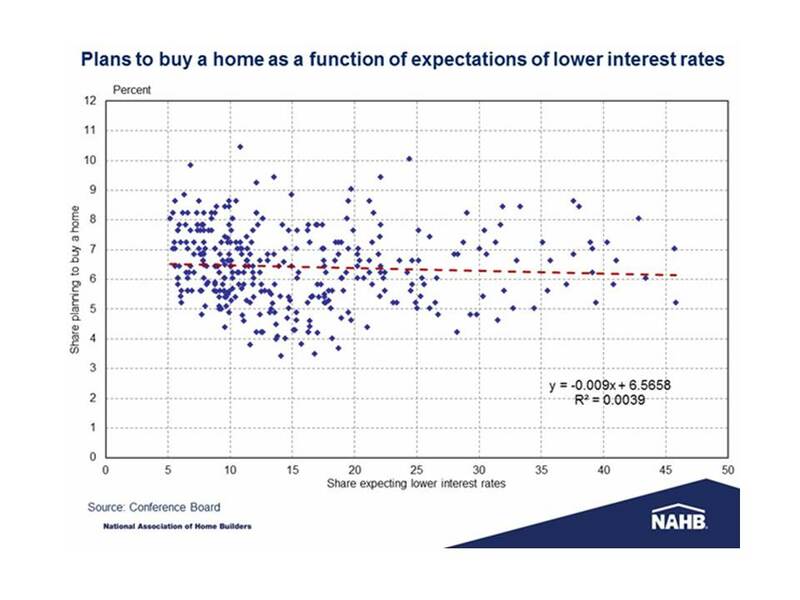 The share of respondents with expectations of lower interest rates has a small negative correlation with the share planning to buy a home, suggesting a slight dampening effect as potential buyers wait for lower borrowing costs. As with expectations of higher interest rates, the effect is small, and the analysis indicates that changes to plans to buy a home are largely driven by other factors. 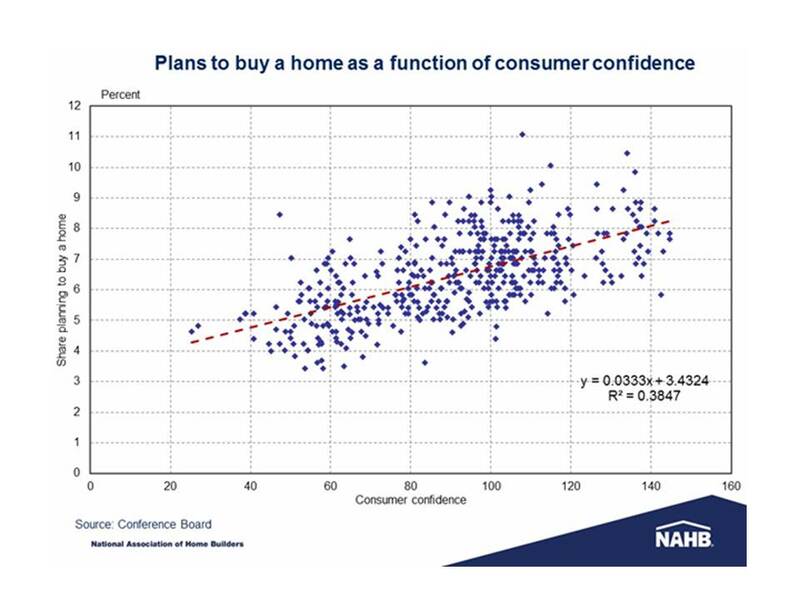 In contrast, the relationship between plans to buy a home and overall consumer confidence is much stronger. Higher shares of respondents planning to buy a home are associated with higher levels of consumer confidence. The steeper slope of the trend line indicates the share of respondents planning to buy a home is more responsive to the level of consumer confidence than expectations of changes in interest rates (either up or down). The analysis also indicates that substantially more of the change in buyer plans is “explained” by consumer confidence than by interest rates. Interest rates are likely to rise going forward, as the 64.4% of respondents believe, but the evidence suggests this will not have a large negative impact on home buying. Instead, the steady rise in consumer confidence from the recession lows back to near its pre-recession peak will have a more substantial and positive impact on home buying.